Finally, we get to see more of Mitsuki’s character, after Mirai is almost unwillingly dragged into the Literature Club. After being trapped with two hopeless perverts, I’m sure Mitsuki is relieved to finally have another girl in the club. Not only that, but I think Mitsuki is grateful to have a girl friend too. Judging by her flashbacks, she wasn’t able to make that many friends because of her status as a Spirit Warrior/Exterminator/Warden (depending on which translation you read from). What I like about this character development is that it all occurs without anyone saying a word about Mitsuki or her past really. The brief glimpses of her childhood, along with the many different facial expressions we’re treated to, speak volumes enough of Mitsuki’s character. 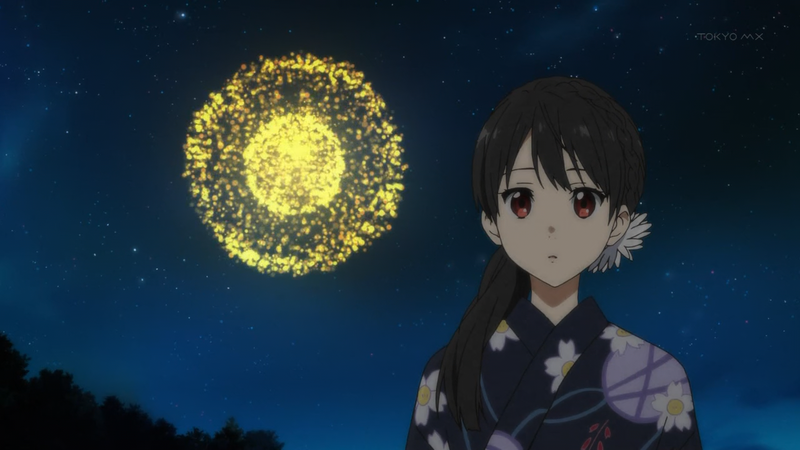 Even though you can tell how much she wanted to go to the lantern festival, she doesn’t want to bring it up to Mirai because of the sad memories it brings up. Thankfully, Mirai is thoughtful enough to drag Mitsuki along with her. This episode made it really hard not to ship Mirai and Mitsuki. 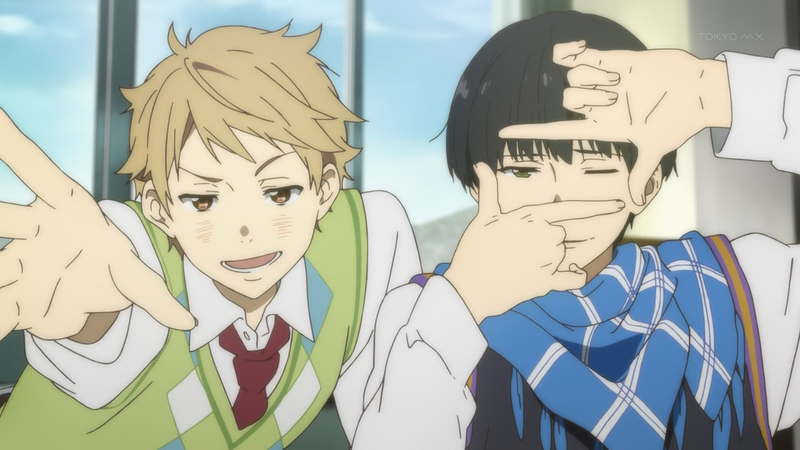 I guess that’s fine since Hiroomi and Akihito are shipped to hell as it is. Even if you don’t ship the two girls, it’s easy to see how much of a positive influence Mirai is for Mitsuki. I mean, this is the first episode where we actually get to see Mitsuki genuinely smile and it’s because of Mirai’s voracious appetite. In general, all of the characters in this series are really likable, though they haven’t really had much interactions with each as a group. It’s mostly been 1 on 1 situations where we get development, which goes along with this theme of being alone that this episode pushed. 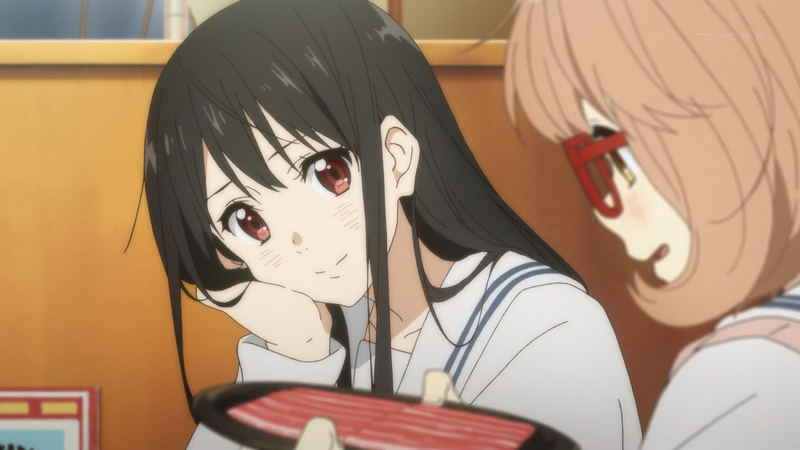 Something that would be interesting to see is a scene between just Mirai and Hiroomi. Though, I’d love more MiraixMitsuki group scenes too. Judging by the next episode’s preview, it looks like we’ll get more of all the characters! I don’t know about all of you, but the animation quality seems to be getting better with each episode. The brief action looked great as always, but even the little things like expression changes or Mitsuki playing with her hair are given utmost detail to. The animation is done in such a natural and beautiful way, plus all the characters are just really good looking. Oh yeah, how about those nudes? What I wonder is who ordered the naked cat pictures. This episode was a nice change of pace from the previous one and there were definitely some great interactions between Mirai and Mitsuki. Good to see some Mitsuki character development and backstory here since the two leads definitely got the most attention before.